The equipment section has been overhauled, weapon size equivalencies have been clearly described. Due to the great size of the known world the inhabitants have many varied forms of speech; therefore, there is no true common tongue throughout the world. Whenever a character would ordinarily take “Common” as a language, they should instead select a single regional language. Most of the racial languages can be found throughout the world. In some realms, racial influences are so strong that a racial tongue acts as the common tongue of a given region. The most common regional language is, by far, Athalish, due to the vast number of individuals who have roots in this realm. Athalish is the tongue of the elven empire. It is derived from ancient Elvish but simplified so as to be easily intelligible by “lesser” races. Athalish bears many similarities to Latin. Auldelian is a tongue descended from Dollite through the intervention of Ashaneron in the rescuing the fallen of Donlin from the abyss. The Auldelian tongue was nearly wiped from the world during the Auldelian cataclysm and survives now only in written form. Legend holds that at the height of the Auldelian empire, the language was heavily laden with words borrowed from Inspir. To thwart the power of the mage-kings, the gods decreed that no creature may teach the Auldelian tongue to another. Artefacts from before the fall bearing Auldelian writing can only be deciphered with the Linguistics skill or through magical means. The spoken form of the language is for the most part unrecoverable, but dedicated translators can acquire a working understanding of the written form. Many creatures descended from the Auldelians such as gangrel and volanti claim to be fluent in spoken Auldelian. The language they speak is actually a form of Lonic. Aurogaelb is the most common language spoken in the orc's teeth. Orcs elsewhere in the world speak Aurogaelb also. The Halflings and Gnomes of Dallaros speak Dallish. This curious tongue is rooted in two highly distinct languages, Ancient Halfling and Twinling, each with has their own tense and conjugation structure. As a result there are often dozens if not hundreds of ways in which to convey a thought in Dallish which makes it a superb language for poetry and wordplay. Non native speakers find if difficult to gain a mastery of this complicated tongue and must devote twice as many skill ranks to learning this language. If they only devote the usual number of skill ranks they can convey their thoughts adequately but must make a DC 10 intelligence check to interpret spoken Dallish. Gnomes from the Deepinghome and elsewhere in the world sometimes have knowledge of Dallish. Dollite is the language spoken in the western kingdom of Merridian. The name of the language derives from the now destroyed capital city of Donlin. Dollite bears significant similarity to Middle English. Drughu is the language of the drughu, the forest folk of Auldelia. Drughu has borrowed many words from Sylvan and from old Lonic. It too uses the Ogham alphabet, though it is found written scarcely more than Lonic. A secret language known only to druids. Druids are forbidden to teach this language to nondruids. Druidic uses the Ogham alphabet. Unlike writers in Lonic, some druids do write at length in this alphabet. Characters with the Linguistics skill may use it to discern the meaning of druidic text. Dwarves the world over speak Dwarven out of reverence to Moradin the soul forger their creator. Dwarven script is composed on runes and is similar to Norse. 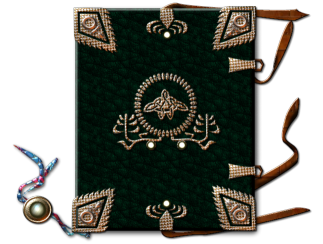 Elves the world over speak Elven, sages suggest that the knowledge of this language is innate to all elves as even those torn from their people at a very early age are able to converse in the language to a limited degree. Elven is a melodic tongue. As the elves developed much of the magic use by civilized races Elven is the predominant language used when casting spells. Wizards and other arcane casters who prepare spells receive a +2 bonus to Decipher Script checks made to determine the meaning of Elven text. The language of the highest of celestials, Inspir is a tongue that makes all others seem as a death rattle. Only deities can be fully fluent in Inspir, and they typically only use it to reshape their celestial realms and cause new races to spring into existence. Needless to say, this tongue is seldom heard on the Prime Material Plane. This intricate and incredibly complex tongue can only be deciphered by non-native speakers with the Linguistics skill or through magical means. Only outsiders with the good subtype may learn this language. Inspir does have a written form; in most instances, such writings are tied to powerful magical effects. Inspir is the language from which words of creation (BE) are derived. Characters with the Words of Creation feat receive a +5 bonus on Linguistics checks to discern the meaning of Inspir text. Jyptic is the language of Jiptala. It is written with pictographic hieroglyphics and bears a significant similarity to ancient Egyptian. Lonic is the tongue of the natives of Karalon. Lonic is divided into two dialects: North Lonic, spoken in central Karalon and Aire, and South Lonic, spoken by the native peoples of Mazavi. There are few speakers of South Lonic due to the Athalish exile to the Mazavi region, which essentially destroyed the natives’ way of life. Thus, Lonic now refers primarily to the northern dialect. Northern Lonic is structurally similar to Gaelic. Lonic employs an alphabet known as ogham, but the strong oral traditions of the Karalon natives preclude the use of this script for any but the briefest messages such as signposts and grave markers. Written Lonic sentences are essentially unheard of. Also known as high draconic, Rastrix is the formal tongue of dragons used in interactions between dragons themselves for special purposes such as making oaths. Rastrix forms the basic language that draconic spells are cast in. This intricate and incredibly complex tongue can only be deciphered by non-native speakers with the Decipher Script skill or through magical means. Only characters of the dragon type may learn the language; true dragons receive this as an automatic language once they reach the first age category that allows them to cast spells. The Shadow Tongue is ancient beyond reckoning, spoken by the most powerful denizens of the lower planes before the beginning of the blood war. The tongue is remembered fully only by some of The Nine and the demon lords of the abyss. It is thought that even Ludimar has not yet mastered the Shadow Tongue in its century of deityhood. Only outsiders of the evil subtype may learn this language. The Shadow Tongue does have a written form; in most instances, such writings are tied to powerful magical effects. Inspir is the language from which Dark Speech (BoVD) is derived. Characters with the Dark Speech feat receive a +5 bonus on Linguistics checks to discern the meaning of Shadow Tongue text. Silent Cant is a vast language that incorporates somatic gestures similar to those used in spellcasting for communication. According to legend, it is the native tongue of the Gaia spirits. Silent Cant is far more than simple hand gestures; the true Cant is, in fact, a mode of communication that can be expressed by all living things if they are taught the motions appropriate for their form. Knowledge of one form’s Cant does not allow characters to converse with creatures with different anatomies. Silent Cant can thus be considered numerous languages such as Silent Cant (Humanoid), Silent Cant (Avian), Silent Cant (Fish), Silent Cant (Arachnid), Silent Cant (Elemental) and so forth. The specifics of the humanoid dialect of this language are a guarded secret of the Silent Hand monks from the continent of Karalon. Individuals may learn to express Silent Cant with their hands if they find an appropriate tutor. Some rare creatures have mastery with Silent Cant, these include the Gaia spirits and perhaps dryads. This character has acquired complete mastery with Silent Cant and may use the language to converse with any creature fluent in a dialect of Silent Cant regardless of anatomy. Knowledge of the cant allows a character to discern meaning in the seemingly innate or random subtle movements of any living creature, granting a +5 bonus to Diplomacy, Sense Motive, and Spot checks to detect a disguise. A close relative of South Lonic, Thausic is the language of the humans native to the Orc's Teeth Islands (as opposed to recent colonists from Karalon or Echer). While spoken all across the islands by tribes of humans and populations of human settlements, over a third of its speakers live on the Isle of Meruk. It is the official language of the barony of Galatha, spoken in Stillwater and Oreon, and also the language of Lurand and Kothreon. It is however only a secondary language in Nilport and Cormuk, settlements founded mainly by Athalish speakers from abroad. Thausic is most well known outside the Orc's Teeth by its association with the Barony of Galatha, and is thus often referred to as Galathan, the name of the dialect most common in Meruk. Other dialects include Lurandic of Highfang, Kothronic of Gol Lor, Longfang, and Gol Orág, and Sarrian of Sarthorn. Smaller tribes who are more mobile tend to have a more neutral accent, however Orcish is becoming more commonly spoken in the nomadic tribes, and Thausic more common in the settlements (with the notable exceptions of Dachoen, Nilport and Cormuk). Thausic has many words borrowed from the Orcish language—including its namesake, borrowed from the orc word for “human”—but it is still structurally similar to Lonic. So close is Thausic to its cousin language Lonic, that characters who speak Lonic have a chance (Linguistics check, DC 20) of understanding Thausic speech, especially if they also speak Orcish (Linguistics Check, DC 15). The Thausic spoken on the islands of Neartooth and Fartooth is the most similar to South Lonic, and is without many of the words borrowed from Orcish. Their speech is often considered a dialect of South Lonic, rather than Thausic. Thausic is written in an adaptation of orc runes. Written Thausic is usually only found in permanent settlements, and is most common in the Barony of Galatha.